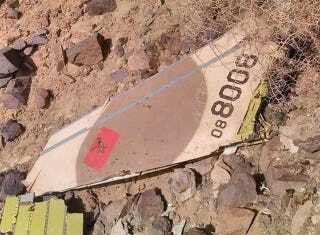 A Moroccan F-16 and a Saudi AH-64 Apache both went down while operating over Yemen yesterday. The crew of the Apache has supposedly fallen into Houthi Rebel hands while the F-16’s pilot fate remains less clear, although grisly images of a body said to be located at the crash site are making their rounds on Twitter. Details remain sketchy, but sources say the Moroccan F-16 was hit by some sort of fire and its wingman did not see its crew eject. Morocco has pledged six of its Block 52+ F-16C/Ds to the Sunni Arab dominated coalition aimed at defeating Iranian backed Houthi Rebels that are now in control of many of the Yemen’s most strategic locales. Morocco has 24 F-16s which are highly advanced and some of the newest in the world, with the whole fleet being delivered within the last five years. Meanwhile, near the Yemeni-Saudi border, photos have surfaced showing what appears to be a crashed Apache surrounded by vehicles. Both crew are reported to be alive but have fallen into Houthi Rebel hands. This comes after reports that another Saudi Apache was downed by Houthi Rebels on Thursday, a claim that Saudi Arabia only partially disputes, saying that the attack chopper had technical difficulties and came down on their side of the border. Regardless of what actually went on, the air campaign over Yemen has not stopped in any way as some reports suggested, in fact it is probably safe to say it has only become more volatile with every passing day. Saudi Arabia has nearly 100 Apache attack helicopters and has been operating the type for decades. A dozen of the most advanced Apaches in the world, the AH-64E, began to arrive in The Kingdom during Fall of last year, and much of the existing fleet of AH-64As and Ds will be getting extensive upgrades in the coming years.